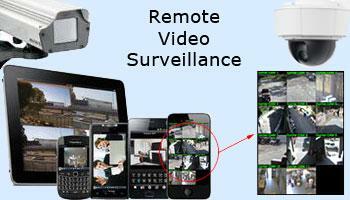 RVS, stands for Remote Video Surveillance. High quality, digital video surveillance systems designed by NTI. An RVS system allows you to record, manage and view live video of your cameras from one or more locations from anywhere. Whether you are looking for a ready to mount camera kit or a full professional installation, we have everything you need to increase your security. Be proactive rather than reactive by securing your own borders. When you are away, the RVS system allows you to securely access LIVE or recorded video from your computer, tablet or smartphone. Our high quality IP camera kits come pre-configured and ready to mount out of the box. We take care of all the technical part prior to shipping. When your kit arrives, just mount the camera, connect a few cables and your are done. If you need assistance don’t worry just give us a call. Record video to internal memory card in the camera. Basic video recording software included with camera purchase. Advanced video recording software available. Camera styles: Fixed, pan-tilt-zoom (PTZ), indoor, outdoor, wireless, vandal-proof. If it is not feasible to run wires to your outdoor camera, we have a solution. Add our optional outdoor, long range wireless kit to your order during checkout. Transmit video up to 1 mile line of site. Indoor cameras we can use wireless cameras in most environments. If you require more than a simple 1 or 2 camera kit give us a call. We can help you plan out a large commercial project and send you a formal quote. We have long range wireless equipment allowing us to mount a video camera almost anywhere. We specialize in difficult and seemingly impossible installations. When others tell you it can’t be done, hang up and call NTI…we can! If you monitoring a large number of cameras or require more display area, consider our QuadStation Systems.